The Blue Moon Dancing Pencils Writing Club is running a right brain novel writing workshop over four weeks, sponsored by Felicity Keats. This attracted 40 members of the public, who really enjoyed the two hours of finding material for novels. Right brain creative writing is different! One does not “think out” the plot. The plot isn’t already in existence. It is discovered by right brain writing – characters, the problem, the setting, all emerge with writing. Participants were stimulated to create atmosphere and background. They were given the tools of shifting to their right brains. They were asked to keep writing daily as they unearth their stories. The Ilanga photographer called in to photograph the very involved group who assured us that they would be back next week, for more right brain stimulation. The course will spread over four weekends, during which time the plot of their novels will arrive. They will be shown how to arrange their material into chapters, then left on their own to finish their novels. Those that do, can expect them to be launched in 2013! Thanks to the SABC and to Nhlanhla Nxele, news correspondent who stimulated all this to happen. It was the second weekend session of right brain novel writing. 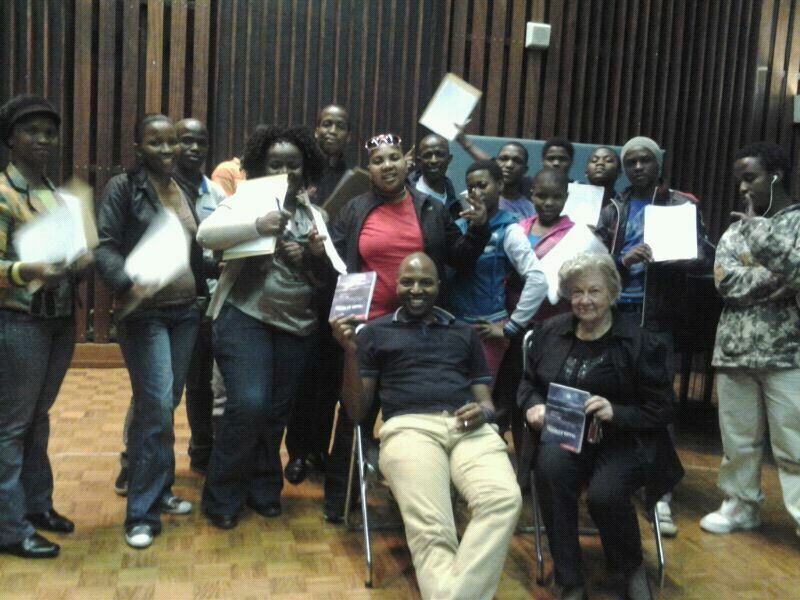 20 committed members of the public again returned to the Blue Moon Dancing Pencils Writing Club, held in Durban at the SABC head office. These writers all BELIEVE they will get a novel written in the next two months, as a result of right brain writing. Pens don’t stop as ideas pour forth onto their papers during their 2 hour Sunday afternoon session. The inspiration behind them is Nhlanhla Nxele, a journalist who wrote his first novel purely from right brain writing. He inspires them before they start and as they finish. The course is sponsored and facilitated by Felicity Keats. This Sunday the 11th was the last of four weekend right brain creative novel writing workshops that Felicity gave in the Blue Moon Dancing Pencils venue in the SABC Head Office in Durban. 20 aspiring members of the public began the course and 14 stayed to complete it. This included writing the back cover of their books from their imaginations and seeing their books in their heads as videos. During the four workshops the writers have found their characters, found their story, written a good deal of it, learnt how to design it into the shape of a novel and even how to create a family tree for their new story-book friends! Journalist Nhlanhla Nxele will kindly support them for a few more weekends of writing in the Blue Moon Venue, and when they have completed their handwritten stories, the Dancing Pencils team will help them by typing and editing their work.